As part of the celebrations to mark the 90th birthday of Queen Elizabeth II today, a lovely family photograph has been released. It shows the monarch surrounded by her five great-grandchildren and two youngest grandchildren, and they all look adorable. In the tradition of royal portraiture, the queen holds her youngest great-grandchild, the Duke and Duchess of Cambridge’s daughter, Princess Charlotte, 11 months, in her arms. But it’s another little royal who’s stealing the show. To the right of the queen stands Mia Grace Tindall, the 2-year-old daughter of Olympic horsewoman and daughter of the Princess Royal Zara Phillips and former England rugby star Mike Tindall. In her hands she proudly holds her great-grandmother’s classic black handbag. The monarch is never seen in public without an elegant handbag, and one of her favorite brands is Launer London Traviata, which are handmade at a factory in England and have been spotted on the queen’s arm since 1968. Mia, who is 17th in line to the throne, is six months younger than her second cousin Prince George, but she’s obviously growing up fast and keen to take responsibility for her great-granny’s famous bag. She looks like she’s on her best behavior, but if you look closely, you can see a cheeky smile. Last year she was spotted causing mischief as only a 1-year-old can, having a tantrum when Zara took her away from an electric generator during the Festival of British Eventing in Gloucestershire. 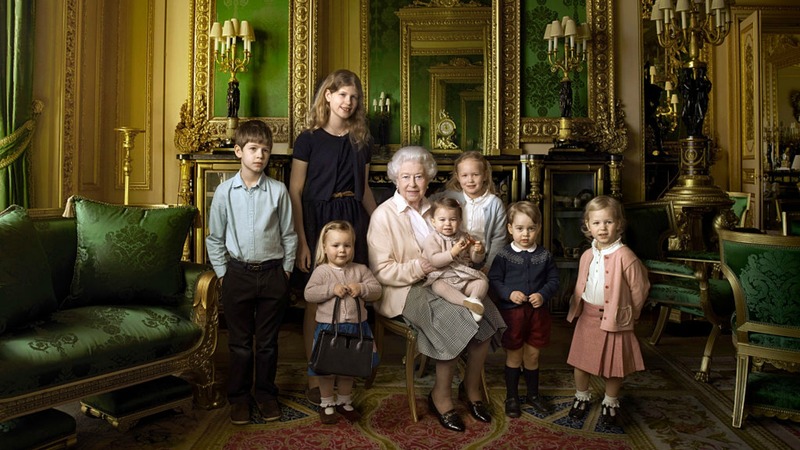 Also appearing in the lovely image, which was taken by celebrity photographer Annie Leibovitz, are Princess Charlotte’s big brother, Prince George, 2; Peter Phillips’ daughters, Savannah, 5, and Isla, 3; and the Earl and Countess of Wessex’s children, James, Viscount Severn, 8, and Lady Louise Windsor, 12. The image is one of three taken by Leibovitz to celebrate the head of state’s 90th birthday. 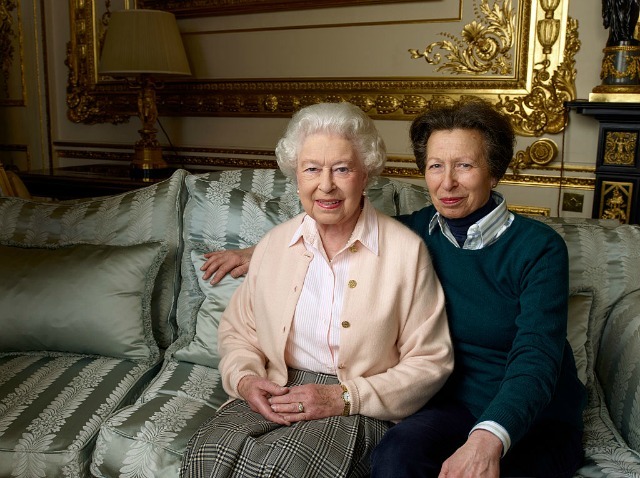 Another captures the queen in an informal shot in the White Drawing Room at Windsor Castle with her only daughter, the Princess Royal. 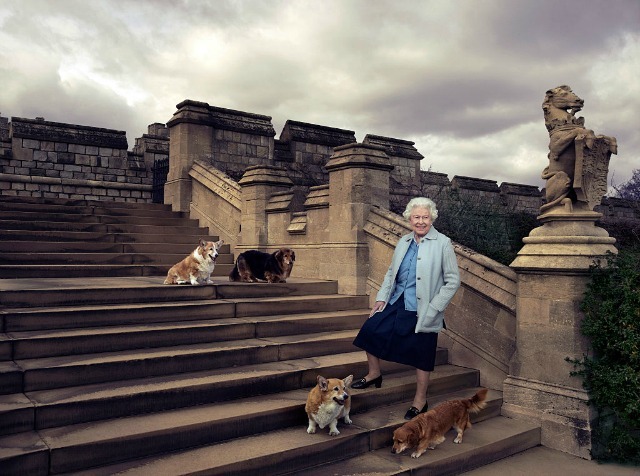 And no birthday photo shoot would be complete without one of the queen with her beloved dogs, corgis Willow and Holly and dorgis Vulcan and Candy. Most of the junior members of the royal family are probably too young to realize the significance of having their picture taken with the longest-reigning monarch. To the rest of us, she’s the most famous woman on the planet, but to them she’s simply Great-granny. And someone needs to carry her handbag.